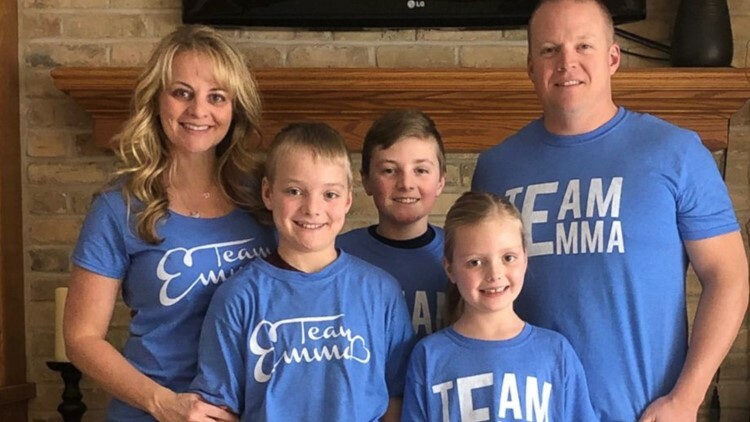 Emma Mertens, 7, of Wisconsin, was diagnosed with a brain tumor on Jan. 23, 2019. A 7-year-old fighting a brain tumor requested for dog owners around the world to send her loving messages from their pups. Now, Emma Mertens is receiving responses from Fido and friends — by the thousands. "If you knew Emma, she's the most kind, big-hearted girl," the girl's dad Geoff Mertens, of Wisconsin, told "Good Morning America." "To see so many people take a few minutes out of their day to put a smile on her face is overwhelming." Emma was diagnosed with an aggressive tumor called DIPG on Jan. 23. She is now undergoing radiation at Children's Hospital of Wisconsin - Milwaukee. DIPG, or Diffuse Intrinsic Pontine Glioma, is a type of brain tumor found in an area of the brainstem, according to the DIPG Resource Network. DIPG primarily affects children and most diagnoses occur between five and seven years of age. "We're doing everything we can to beat this thing," Mertens said. "We know that we have a very steep road ahead of us. We aren't going to stop fighting until we can find a cure for this." Parents Geoff and Tammy Mertens said Emma loves dogs. Emma's family doesn't own a dog, but they often dog-sit for neighbors — something Emma enjoys. Emma Mertens, 7, of Wisconsin, is pictured with her family in an undated handout photo. 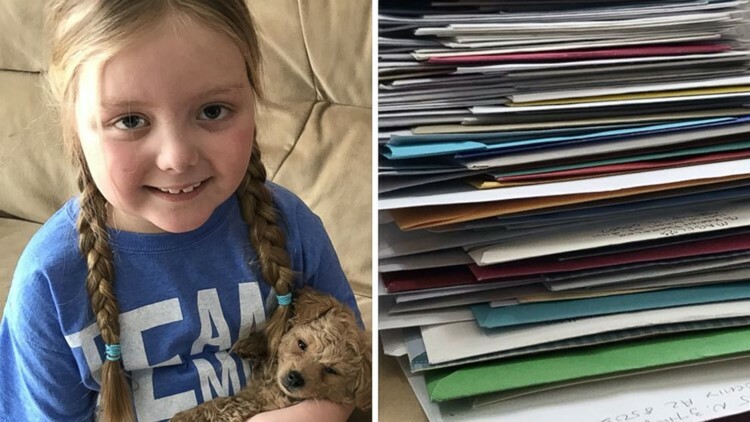 To help her smile through treatments, family and friends sent Emma letters from their dogs. The request, which was initially made through Facebook Messenger, was moved to a P.O. Box and to an email account, where people as far as Scotland and Venezuela sent photos and messages from their canines. Strangers posted more dog letters on the Mertens' GoFundMe page. "Hello Emma! My name is Sadie," one dog "wrote" in the comments section on GoFundMe. "I'm a girl-dog, and the bigger dog is my older brother, Scooter! We are Boston Terriers, all the way from SOUTH AFRICA! We are super friendly and love to play, cuddle and kiss! Sending you well wishes and LOTS of hugs & licks!" "My name is Peppi," another pup "commented." "I live in Rovaniemi. Rovaniemi locates in northern Finland that also is called Lapland. Santa Claus lives here, he's almost my neighbor." Kelly Zimmerman, the GoFundMe moderator and neighbor of the Mertens' told "GMA" that Emma loves seeing all the letters. "The thing that brings Emma joy is seeing dogs, interacting them," she said. "It's a devastating diagnosis but seeing her smile in present day and seeing those moments has carried the hope for the family." Mom Tammy Mertens said Emma's email account is currently full. However she's received more than 50,000 letters from dogs and is taking more through the P.O. Box. "Like Geoff [Mertens] said, Emma, the only thing she wants to do is make other people happy," Tammy Mertens told "GMA." "Having our community around her and supporting her is amazing."